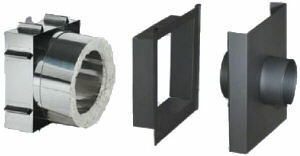 Saf-T Thimble is Heat-Fab's through-the-wall thimble assembly. It is intended for use with masonry chimneys only, and where the distance from chimney to finished interior wall is no less than 4" and no more than 9 1/2". Saf-T Thimble allows extremely hot smoke and gases from a wood-burning appliance to safely pass through a wall to a chimney flue. Saf-T Thimble's heavy-duty insulated steel construction shields the wall from heat, ensuring safe venting. The convection heat shield moves heat out, while its insulated construction protects combustible surfaces--reducing the 18" minimum clearance. Designed so the stove pipe can be readily attached and removed, Saf-T Thimble allows easy cleaning and system maintenance. The UL Listed Saf-T Thimble allows single-wall stovepipe to pass through a combustible wall. It attaches to the chimney therefore avoiding a dangerous breach should the chimney settle and start to pull away from the house. The Saf-T thimble features a solid-pack insulation that telescopes inward toward the wall, allowing for easy adjustment for wall thicknesses of 4" - 8 1/2". Choose from 6" or 8" models. Both need a 16" wide by 17" high opening for installation. Instructions are included.